Up until about 2008, I never intended to be in front of the camera. I really felt that my place for supporting the ushering in the Golden Age, the Great Awakening, was to be behind the scenes… as a producer, creating conscious media and then marketing, PR and internet strategies for healers. As my telepathic communication increased exponentially, I was given details of other paths I was being guided to pursue… things that shocked me and were uncomfortable… such as starting a show and going in front of the camera. With Free Will, of course I had a choice, and as I asked daily for things to align in my Highest Good, this is what my Guides suggested many times! I went in front of the camera as far back as 2009 to start anchoring an internet based iTV show entitled, Wake Up…Shift Is Happening TV! In February 2010, during the Los Angeles Conscious Life Expo, I rented a suite, hired a camera / lighting crew and conducted about 12 interviews with awesome people who are still quite popular with the gifts and subjects they are bringing forth. Did I ever put those interviews on YouTube? Nope, because of major infiltration which affected my ability to self-fund the editing process, they are sitting in a box in storage. BTW, I was not very good in front of the camera at first… OMG, I stuttered almost to get the show “intro and open” correct… but I feel that has all shifted as I shifted and Activated my I AM Presence. This is also when I started using “The Great Awakening” in my intro motion graphic of the show. There’s a reason I’ve been guided to bring this detail into view. Again, due to infiltration, I stopped doing the show at Reuben’s studio after only 9 shows – the various reasons included funding, but also his business partner at the time didn’t vibe with the subjects and there was push-back from him which resulted in the energy shifting. A few other recognizable names I had on the show are Kerry Cassidy, Bob Dolan and Patrick Flanagan. I was also back and forth between Los Angeles and Mt. Shasta A LOT. I spent many months in isolation in Mt. Shasta and Ashland, OR going through up-leveling experiences, Activations, teachings from my Guides and more… details aren’t necessary here. When Scott came to Mt. Shasta to do spiritual work with me in December 2013, I was doing online retreats, a few in person retreats, and launching “I AM Awakening Academy”. Scott joined me for a workshop I was scheduled to give at the LA Conscious Life Expo (2014) and we also were on Sean Stone’s BuzzSaw show that week too. We got married QUICKLY (yes we eloped) in February 2014! We moved to Australia to “close down his house and life there”, plus enjoy Australia Gold Coast living for a while. We did various one-off shows during that time, which included our “Counter Protocol of Light SuperBowl 2015” show. In which we had a panel of people, including Sean Stone. We did a live show the entire football game and during the half time show we went into prayer, Activation of Light and transmuting the nefarious energies of ritual the half time show engage(s) viewers (unknowlingly) in. The precursor show to that show was with James Gilliland of ECETI. We also did a show with John Ramirez, an ex-warlock… He was rated as the 3rd most powerful warlock in NY when he was engaging with black magic. He has / had turned to the light and Jesus when I found him on YouTube. We had several in depth conversations with him and we did a live interview with him. He confirmed and expanded everything my Guides had been communicating to me starting back in 2005 about infiltration. There were some tech issues with the show and we don’t currently have it on our channel, but may bring that out of storage and see what we can do. What John shared with us, is incredibly important information which I / we will be talking a lot about now. Again, the show motion graphic intro included as the key element “The Great Awakening”. By this time I knew Jack Kennedy was communicating with me and I started to reveal that to people close to me. I used to call him John and in the summer of 2015 he asked me to refer to him as Jack…I didn’t really know then that, that was the name many close to him referred to him as. Waking Up with Deb, We Are In This Together was born in August 2015 when we got the guidance “to get the show on the road”! We had stopped doing most of the online retreats because I wasn’t supposed to be “working” since I was in Australia on a tourist visa and we weren’t ready to go back to the U.S. yet. So Scott got a “muggle” job 🙂 in Sydney and we moved to an amazing apartment that overlooked the famous Sydney Opera House, Harbour and Bridge…it was all right there! We turned our expanded living room into a film studio! I did video after video on various subjects. This is also when I was doing livestream shows AND when I revealed that Jack Kennedy was communicating with me, through me and I did several shows that were messages from him. These are still archived in our Transcend the Matrix YouTube Channel. We did so many videos in a short period of time, that we didn’t get most of them uploaded until a year later because of different events that unexpectedly unfolded in December 2016. Events which took me back to Los Angeles for entertainment industry connections to facilitate my re-entry into Hollywood. As it turns out, they didn’t pan out…it was a very stressful time…which included some very dear people that I trusted and had provided many many hours of free Activations, tuning in and support to, turned on me…it was a blow to my heart that took several months to heal. The note I’m being asked to bring to your awareness here is that the proclamation I have inserted into every video, every newsletter, every closing of shows, webinars etc. is We Are In This Together! I’ve just been told (April 2018) that it’s all documented for a reason that will be revealed in the coming months and years… So it shall be! April 2016 our Guides came through with an unexpected communication to “get your asses back to Mt. Shasta”! And so everything was put on hold again while we went through months of “creating reality” in order to purchase our new home and spiritual retreat center. This included packing up our lives in Australia which included quite a lot of home furnishings and 2 cars and then move back to the States. HUGE undertaking! After many months of clearing the energy, working with our timeline and working with the online community we had started, we finally closed escrow and moved into the spiritual retreat center and new home in Mt. Shasta in October 2016! We were blessed to have about 10 people from our online community fly in on their “own dime” to assist in a plethora of things that included driving the truck from L.A., cleaning up the massive amount debris left from the previous owners, moving things in and so and so on. It was an amazing experience to have all of that “community” to ignite our new home, retreat center experience. In mid-November 2016 after we were literally relaxing for the first time in months, our Guides came through with a shocking message about Donald Trump. I’ll share more about that in the coming weeks; it’s a doozy! Within the first couple of months we started to experience an intense amount of push back from the energies that did NOT want us in or on the property. 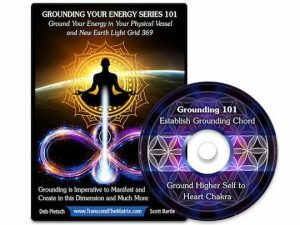 I won’t get into details here, but…It’s been a series of HUGE INITIATION of standing our ground and CLEARING energies, entities and some very intense dark beings. The challenges created tremendous financial AND Time issues. So much so that Scott has taken a job back in Sydney to keep the financial flow moving until we could our spiritual teachings and shows going again! Additionally, the maintenance of the size of house, event building and entire property has been extra-ordinary! All of it has been a major learning curve! By the time we were ready to start focusing on a new website, new tools and retreats, so much had shifted with us and in the world, that Waking Up With Deb now felt less cutting-edge, less spot-on, than it did in 2015. A LOT has shifted in that period of time energetically… thankfully!! 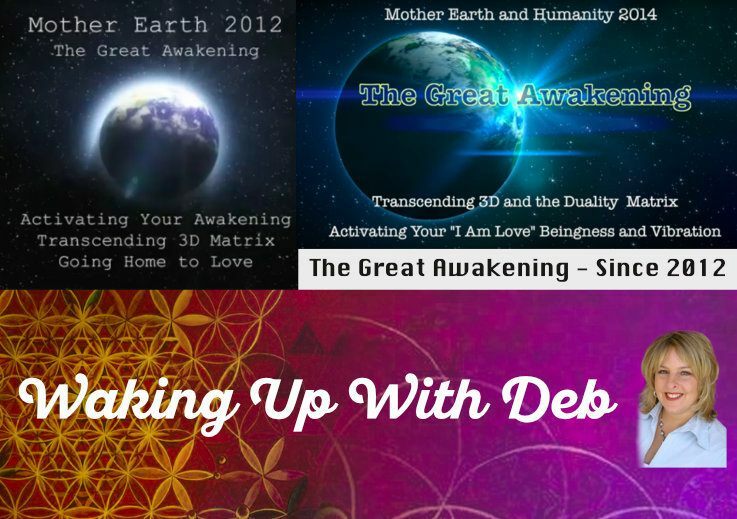 For six years, I have referred to the Great Awakening and Transcending the 3D Matrix… so it was time to change it all up and re-launch with a new focus, new brand, new look and feel AND with both of us aligned and present in the presentation. The funny thing about the timing of our development of this new brand was early November 2017, which is when Scott came home for two and a half months solid for the holidays. The 4Chan / now known as Q drops started coming out at the end of October … who would have thought there’d be some alignment with that…but there is…the evidence is undeniable, which is why my Guides asked me to make the connection of those elements obvious. That’s a big backstory! And that’s only a small portion of it! Thank you for engaging and for your time to have engaged with this. Telepathic Communicator, Activator, Spiritual Teacher, iTV & Radio host, Author & Award Winning Producer. Founder of I AM Awakening Academy and Owner of Mt. Shasta Ascension Spiritual Retreat Center, Partner & wife to Scott Bartle and guardian/Mom of two long haired Dachshunds; Bodhi Meyer & Princess Sunshine Magdalene! James Gilliland’s Show Guest Deb Pietsch ~ Solutions for Infiltration, Q Unifying & More! Michael Lopez on James Gilliland’s Show Guest Deb Pietsch ~ Solutions for Infiltration, Q Unifying & More! Verified Client on Clearing Your Field 101 ~ Begin Here! Making sense of the illogical mess the world's in and providing tools and solutions helping you to Transcend The Matrix.